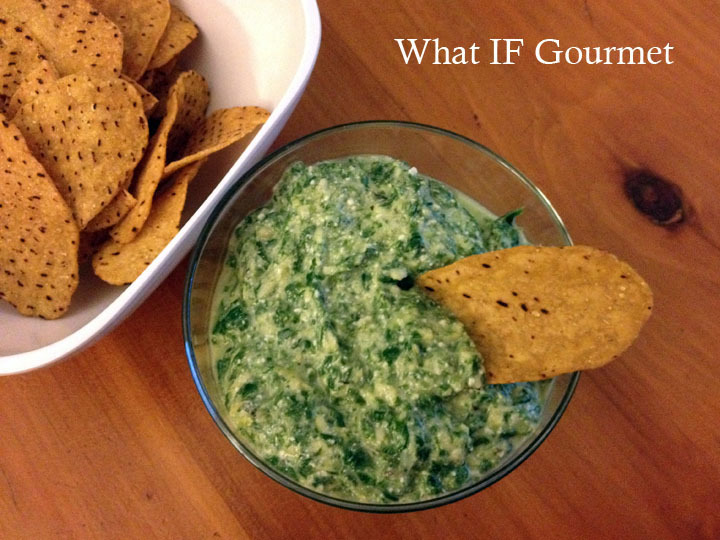 Dairy-free spinach artichoke dip with gluten-free sweet potato tortilla chips. This dip is healthy enough to be a legit side dish at dinnertime, so you can snack away with abandon and without the guilt. This is a good thing, because once you taste it, you may just want to steal away with the bowl of dip and a spoon. Silken tofu adds body and a creamy mouthfeel, but I guarantee this dip is so flavorful and nesty that even the most tofu-averse (the Gent falls into that category) won’t suspect it’s there. You could also serve this as a flavorful, nutritious topping for baked potatoes or sweet potatoes. Heat the olive oil over medium heat in a large (12″) skillet. Peel the garlic cloves and add them whole to the hot oil, and give them a quick stir. Rinse the baby spinach with cold water and then add it — with the water still clinging to the leaves — to the skillet. Cover the skillet and let the spinach steam for about 2 minutes. Remove the lid and gently stir and turn the spinach with a pair of tongs, until it is all covered with olive oil and wilty. Continue to cook for another 2 or so minutes until the spinach is thoroughly wilted. Stir in the herbs and salt. Set aside to cool for 3 to 4 minutes. Add the drained artichoke hearts and the spinach mixture to a blender or food processor. Pulse until roughly chopped. Add the lemon juice and tofu, and process until mixture reaches desired consistency. I like my spinach artichoke dip a bit chunky, but it will taste just as good with a smoother texture. Taste, adjust seasoning, and serve warm. This entry was posted in alliums (garlic/onions), Anti-Inflammatory Ingredients, Appetizers, citrus, cruciferous vegetables, Dairy-free, Gluten-free, greens, herbs, legumes, monounsaturated oils, Nut-free, Recipes, Snacks, Vegan, Vegetarian. Bookmark the permalink.